“When the infant’s caretakers act to soothe and hold it, the infant internalizes the qualities and functioning of its caretaking environment. This will have an effect on how the infant perceives and experiences danger, tolerates affects, and develops a capacity to allay its own anxieties.” Ivri Kumin, 1996, p. 27. Although the second half of the book deals in more detail with the nine signals, I want to take some time here to talk about the process of learning to understand their meanings and responding to them. Becoming comfortable with your child’s expressions of the signals provide enormous benefits to both of you: It helps the two of you establish a good relationship; it helps your child develop the ability to regulate tension and increases the feelings of happiness and security; and it can prevent all kinds of problems and enhance your child’s potential. The actual process of perceiving and responding to your infant’s signals requires an awareness that the infant has signals and the child is making an effort to communicate. Next, it requires the adult to internally integrate the incoming message with their own understanding, past experience and so on, so they can sort out the possible meaning of the signal — that is, the meaning of the message that’s being sent. And, finally, the process includes a response from the adult. Dr. Ivri Kumin, a psychoanalyst in Seattle, Washington, has recently written an elegant book that delves into these processes in great detail. You already may have had this sort of experience: Baby starts fussing while you are doing the laundry, talking on the phone, getting dinner or taking a shower. On any given day, you may react differently—depending on your own mood, your degree of alertness to what’s going on, outside pressures or just plain old exhaustion. But let’s say you finally call out, “Hey, sweetie, I’m talking to Grandma. I’ll be there in a minute.” The baby quiets down after she’s heard your voice and you go back to the call. It’s not a solution, however. Pretty soon the baby starts up again, more persistently and louder. You figure she is just unhappy because she isn’t the center of your attention right now and she can learn to live with it another minute or so. You don’t call out this time, instead you walk with the phone into another room to try to hear over the crying. Suddenly, baby launches into full scale, air-gasping bawling. You’re irritated and the baby’s angry. You hang up and rush to see what’s going on. Now it’s not easy to get her to calm down. You feel miffed and frustrated. And so does baby. You try a bottle; check her diaper; walk her around the room; show her the stuffed animals. You work to figure out what signals the baby was sending and why. And, often there’s no one to pat you on the back or bring you a cup of tea or say sweet things in your ear. You’ve got to calm yourself down. All this happened simply because when baby signaled ‘Hey! I’m over here. Where are you?’ you ignored the question and tried to pretend that nothing was being said to you. Imagine if it had been your friend or partner calling out. If you simply ignored them instead of responding appropriately, they’d get ticked off and feel dismissed. Same with baby. That’s why, even when it seems like you can never have a moment for yourself, and it all feels like too much, you and baby will end up less hassled and more attuned to one another if you respond appropriately. You might say to the person on the other end of the phone, “I have to go check the baby for a minute. Hold on.” Then, if you need to change the diaper, or pick baby up, you tell your caller, “I gotta scoot. Call you back when I can.” It may seem frustrating not to finish your call, but you can bet your life will be a whole lot less frustrating if you attend to baby in a timely fashion. That said, I don’t mean that you can never, ever respond slowly to your child’s signals. There’s little harm from an occasional miscommunication or the inevitable frustration that results — after all there is a lot going on in your life at any given moment. The trick is not to respond so slowly that the baby is traumatized. Every child and adult is going to experience frustration at some time, it is part of life and learning how to handle it is necessary for sound emotional development. So, you don’t need to be overly anxious and rush to decrease the slightest frustration or deny the child a chance to overcome it on his own. If, however, you establish a pattern of inattention or permit traumatizing levels of frustration, you are going to produce longer-term negative repercussions. Remember, while babies are often resilient, they can be quite delicate when it comes to their emerging feelings. Single episodes of misunderstanding rarely cause lasting damage; but repeated misunderstanding of signals can cause problems. If your child finds that you regularly miss, ignore or respond unhelpfully to her signals, she will have a far harder time developing a positive sense of self and will have a difficult time feeling she can depend on you. In addition, spending time with your infant and child sends the message that she is interesting and loved and enhances her internal sense of being valued and important. Throughout this book, I often mention five key issues in child development that have emerged from recent scientific studies. The first four involve the signals directly and provide a simple outline of how a wise parent can best communicate with an infant. They are: 1) encouraging the reasonable expression of all signals, positive and negative; 2) maximizing the signals of fun — interest and enjoyment; 3) attending to the signals for help and dealing with whatever triggers them; 4) putting words to the signals as soon as possible and labeling the feelings; and 5), being aware of your child’s intense desire to be like you. Let’s look at each of these points in some detail. Key #1 Allow full, reasonable expression of all signals. Allowing and encouraging the expression of Signals of Fun and Signals for Help is perhaps the most important key to establishing good communication with your child and nurturing healthy emotional development. Signals for Fun — interest and enjoyment — are positive signals. If you and your child can discover what she is interested in, and you both believe that her interests are important, your baby has a better chance to understand herself, her potential, and ultimately to find a fulfilling life’s focus to which she can give 110%. You can encourage and reinforce these positive signals by observing and validating what stimulates your child’s interest/enjoyment and finding opportunities to offer her other similar activities and experiences throughout the day. For example, when handing your child her much-loved stuffed toy, you might say, “What a wonderful teddy bear you have.” At the playground, you can reinforce her delight by saying, “What fun it is to swing. Wheee!” If you see that she has been having looking at a book, then you can make sure the two of you take time to read together before she goes to bed. Signals for Help — distress, anger, fear, shame, disgust and dissmell— are negative signals. Encouraging their expression allows the baby to ask for and receive assistance when she needs it. This process of expression and response validates a child’s inner feelings and helps her learn how to manage distress and tension. One of the first positive messages you can transmit to your child is that she has entered a world in which it is safe to express both positive and negative emotions. Sometimes, parents try to help their children overcome distress by telling them to “Buck up!” or “Have a stiff upper lip.” This can be unhelpful. For example, if Susie becomes frightened and cries out when a dog approaches and her Dad says, “Don’t be a cry baby.” or “That dog isn’t going to hurt you,” he is telling her that what she feels is not valid. Susie feels very strongly that there is a good reason to be distressed — the dog looks really huge and unpredictable. But her Dad dismisses the feeling. That makes Susie questions her perception, her rightness in feeling what she believes to be a realistic assessment of her situation and that in turn may erode Susie’s self-confidence and self-esteem. In addition, by dismissing her signal of distress, Dad is telling Susie that he is not going to protect her even when directly asked. Susie’s signal for fear is, after all, her only way of asking for immediate help. By denying that assistance, Dad undermines his daughter’s sense of security and trust in him. Even when a signal may need to be redirected, as when a child’s signal for interest is being expressed by pulling a dog’s ear, you should acknowledge and encourage it. “That’s a beautiful dog, isn’t it” you might say as you gently remove your child’s hand from the dog. “We need to learn to pet him softly.” Or, for example, your child may express the signal for interest by throwing pots and pans out of the cupboards. If that’s not to your liking, the best solution is not to discourage the interest, but to give the child’s interest another outlet. Substitute another toy for the clanging pans or place some toys in a paper bag so the child can get them out of there, much like the cupboard. Suppressing the expression of a signal, whether positive or negative, is not the way to cultivate a healthy, well-controlled child. Children who are not encouraged to express their interest in and enjoyment of the world can turn out to have their potential and capacities constricted. Children who are made to bottle up their negative signals for help can develop escalating feelings of being misunderstood, rage, sullenness, withdrawal and or depression. In technical terms, Key #1 can be stated briefly as: minimize affect inhibition. Key #2 Maximize signals of interest and enjoyment. Not only do you want to allow your child to express a full range of emotions using the signals, you want especially to maximize the signals for interest and enjoyment. You can do this by noticing what your child enjoys — books, animals, pots and pans — and looking for opportunities to repeat those enjoyable activities. And even if you think that what she enjoys is disruptive, don’t squash it. If you need to moderate her interest, do so in a way that tells your child that you enjoy the fact that she is interested and having a good time. For example, say your child grabs a book or magazine and begins to tear the pages. If the book or magazine is not precious, take a moment to observe how the sound, the feel, the smell of the pages and the action of tearing is intriguing to your child; or ask yourself if she might may be imitating Dad’s tearing something out of the newspaper. Then, let your child know you recognize and appreciate her interest: “That’s a wonderful magazine, isn’t it? Such nice pictures, and such great paper.” If you want to take it away from your child so it stays in one piece, offer another piece of paper in its place and say, “That magazine is not for tearing up, but here’s a nice piece of paper that you can play with all you want.” I recall one mother who found her little son putting cheerios in a book, mashing them, and then delightedly opening the book and watching the powder fall out. Her initial reaction? “Oh my gosh! What are you doing? What a mess!” The little boy’s lower lip started quivering, and his eyes filled with tears. Then his mother “got it!” “Oh, this is really neat, isn’t it? What a great sound… and a cool result! Pulverizing those cheerios. Do you want to do this some more? Okayâ€¦Â let’s use this old book, get these cheerios, take your shoes off, and we’ll put you some place that’s easy to clean up…Â the bathtub? Out in the porch?” The little boy had a blast…and it gave the mother a good opportunity, if she had the time and inclination, to teach a little physics: force, changes from one form of a substance to another, and so on. In addition, such activity may have some psychological meaning of importance to the child. In other words, something about the “play” may be related to certain feelings or wanting to be like mother (a pharmacist) or father (a chemist). Or perhaps your child dumps a boxful of paper clips on the floor. Rather than simply grabbing them from her hands and chastising her for making a mess, you can set limits and establish rules and still let your child know you appreciate her impulse to explore and to be interested in what she sees. Take the time to say, “Hey, what have you discovered here? These are paper clips. Aren’t they funny looking. Here let me show you how to put them back in the box. You know, they are too small for you to play with. You might swallow them. Let’s put them back and play with your toy here instead.” This allows you to protect your child, while letting her know that you are tuned into her way of seeing the world and are interested in helping her discover and understand new things. The youngest child will understand the import of what you are saying, even if she can’t comprehend the exact meaning of the words. And don’t worry if what she is interested in — a stick, a potholder, a scrap of paper, a piece of fuzz — makes no sense to you. It has caught her interest and that is all you need to know. Technically, Key #2 is stated as: maximize positive affects. Key #3 Remove triggers for distress. In addition to maximizing your child’s positive signals of interest and enjoyment, you also want to act appropriately when your child sends out signals of distress. Your child depends on you for protection. When something is upsetting, first you acknowledge the validity of your child’s feeling and express your sympathy. But then, you want to remove the cause of the distress, and reduce your child’s anxiety. Early on, infants and young children signal distress primarily because they are hungry, tired, sick, in pain or need their diapers changed. When a baby cries because her diapers are wet, it’s a simple matter of changing them promptly. Other situations may be more difficult to negotiate. Say your child has taken to crying whenever someone wearing glasses comes into view. You may feel upset or embarrassed at the child’s reaction. You may try to ignore the situation or dismiss the upset. This will only tell the child you do not understand and will invalidate you child’s signal of distress. Then, the upset can escalate. Actually, glasses can distort a person’s face and eyes, and distorting of face can be very disruptive to infants and small children who are so tuned into facial expressions as a built-in way of communicating. Perhaps, instead, you can pick up the child and turn her away from the person. You also might ask that person to take his glasses off, or if your child can examine them. The technical phrase for Key #3 is: minimize negative affects (causes, not expressions). 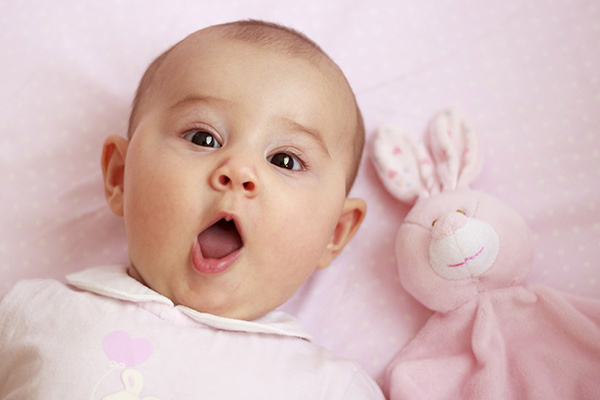 Key # 4 Use words, even when your child is newborn, to express signals. This helps the child develop a child self-control and tension regulation. Before kids can understand everything you say to them, your words, tone of voice, gestures and expression all help make your meaning clear. By talking to your child, you are acknowledging her presence as a separate individual — an important step in building the child’s sense of self. In addition, by labeling situations and signals you are showing your child how to use words as a substitute for overt actions. Eventually, she will see that there’s no need to yell incoherently when she can more accurately communicate what she’s thinking and feeling with a few well-chosen words. In fact, when caretakers put words to feelings for an infant, it actually helps the young brain develop more ways to process information and emotions. It expands preverbal communications to include verbal expression. And you lay the foundation for good tension regulation when you teach your child to identify feelings and find ways to express them verbally. When children are adept at an early age at expressing their emotions verbally they are able to avoid a lot of childhood frustrations because they are able to negotiate for their interests and needs. You can help make your child comfortable with using words to express emotions by labeling the signals as they are expressed. For example, when your infant cries because she is hungry, don’t just feed her, take the time to talk to her, too. You might want to say: “I hear you little one. Are you hungry now? Let’s get you something to eat.” When your baby is startled by a car horn, you might say, “That was a terrible noise. It really startled you.” When your child is enjoying the swings, you might use words to reinforce the positive experience. You can make emphatic sounds like “Wheee!” or say “You are having fun, aren’t you.” This not only validates the child’s feelings, but puts words to various physical sensations. Key #5 Be aware of and use your child’s intense desire to behave and think as you do. Think about it. If your two-year old let’s out a “Damn” when he falls down, he has probably heard Mom or Dad say that word in similar situations. Even before they can speak, kids absorb those kinds of messages — and many more that are far less obvious. If you react to your child’s signals for anger by becoming agitated and angry yourself, your child will think that’s the appropriate response. She’ll learn that anger calls for more anger. The result? A child who just gets more and more wound up as emotions intensify. Parents who are calm and comfortable with a full range of their own emotions, teach their children to be well modulated emotionally as well. Consider this scene: Sonia, a one-year old tottered over to look behind the TV at all the fascinating wires and plugs. Her father spotted her and said quietly, “Sonia, those wires can hurt you if they are plugged in. Electricity goes through them. Here, let me show you how it works with this extension cord that is not plugged in. Or we can play with this neat ball.” Sonia turned away from the wires and went to her Dad, who explained a bit more about wires and electricity using the unplugged extension cord. Then she happily went to play with the ball. “Thank you for not playing with those wires Sonia. I love you,” said her Dad. In this example, the father intervened in a number of ways. He talked with his daughter in a calm voice, telling her the wires were dangerous. Even though she couldn’t understand all the words, she understood the meaning and the tone of voice. In addition, she was exposed to the important process of using words instead of actions to express ideas and feelings. Dad was urgent — but instead of sweeping down and shouting, he calmly communicated the feelings with words. He also offered Sonia an alternate source of stimulation— the ball. Finally, he used positive reinforcement (“Thank you. I love you.”) to elicit and reward a change in behavior. This is much more effective than negative reinforcement or punishment. All of the father’s actions and reactions are teaching Sonia valuable information lessons that will help her grow up into an adult who is kind, calm and in tune with her feelings. When it comes to responding appropriately to your infant’s signals, every parent can use a couple of shortcuts. Here are the most time tested, that generally make it easier to get along together, even when you are reaching the end of your rope. Try distraction. If you want your infant or young child to stop what he is doing, provide an equally intriguing alternative. Don’t want the newspaper shredded on the floor (and then eaten)? Offer another book (one of the indestructible kid’s books now on the market) or a change the venue completely by brining out a favorite toy, a rattle, or by walking with your child into another room. Provide choices. If you want your child to dress warmly, give her a choice between a warm coat or a couple of layers of warm shirts. This lets her feel she has some control and independence and helps her develop her taste. On the other hand, too many choices can breed chaos and indecision. The goal is to find the workable balance. Use rewards, rather than punishment, whenever possible. Teaching a child how to behave can be a positive experience for child and parent; it’s fun for you to help your child grow and your child will feel a great deal of pride and happiness when she does things “right” and is able to win your praise. Whenever your child responds to instruction as you wish, offer thanks and tell her how proud you are of what she’s done. “That’s great! Thanks for putting the knife back down on the table.” “See how much better it looks when we pick you books up off the floor? Thanks for helping me put them on the table.” These simple expressions of your approval will do far more to make sure your child learns the lessons you are trying to impart than any amount of punishment. You may find that as you understand the meaning and purpose of the nine signals that your ideas about punishment evolve. This will be discussed in more detail in chapter TK. But I want to emphasize here that if you use criticism or hitting (spanking) to influence behavior, it is probably because you have run out of alternatives. Take time to come up with other ways of managing conflicts. And remember, in the short run motivating by fear and shame may work, but in the long run it comes at great cost to your child and to your relationship. Swat your child’s hand for picking up the knife and she doesn’t learn what knives are or what to do with the knife (put it back on the table or don’t pick it up in the first place). What she learns is that if she expresses interest in something you don’t like, you’ll make her feel bad. That can either make her hesitant to express her own interests (that can put a real damper on learning and happiness) or simply teach her that she is a lot better off doing the things she enjoys far out of your reach. Spend a decade or more reinforcing that message and you’ve got a pretty alienated teenager. Constant criticism — even if you don’t follow up with punishment — also erodes self-confidence. Many children are tenderhearted. They are easily crushed by feelings of failure or shame when they are told over and over that they don’t measure up to a parent’s expectations. When you are unhappy with something your child is doing, try enforcing rules by example and teaching self-control by being controlled yourself. What about spoiling the baby? Some parents worry that if a child is allowed to be too enthusiastic or to express anger he will become spoiled. I want to state emphatically that anything you can ever do to elicit a smile, enthusiasm or joy in a child, do it! And anything you can do to let your child know that feelings of anger or unhappiness are valid and deserve to be attended to quickly, do it! Soon enough, life will provide more than an ample supply of frustration and heartache. Patents don’t need to — and shouldn’t — supply such troubles. It’s simply mean to say to a child, “You are going to have to learn this lesson kiddo. Life isn’t nice and it’s often tough.” For children, learning about life’s hard knocks — instead of being protected from them — is no favor. Strong, buoyant, optimistic children emerge from families where parents protect them from unhappiness and frustration while encouraging expression of feelings. True strength comes from competence and a reasonably positive sense of self — two qualities that thrive when children are allowed to express a full range of emotions at the same time they are guided toward positive feelings. Allowing your child a full range of expression of the nine signals does not mean that you have given up control. In fact, this process actually allows you to take charge of both your parenting role and your child’s healthy emotional development. At one time or another every parent has to interrupt a child’s signals of excitement or anger. While you want to allow your child reasonable expression of feelings, you need to step in when your child needs help cooling down. Uncontrolled outbursts, marked by kicking, biting or throwing things, may be important signals of distress or anger, but, if ongoing, may require containment and holding as well as verbal labeling. You want to help teach tension regulation — that is, the ability to modulate feelings and manage emotional ups and downs both internally and when interacting with people — not tension excess. So if your child becomes too wound up, try using phrases such as, “That new toy sure is exciting, isn’t it?” “That’s neat — you really are excited!” “You really were frightened by that loud noise, weren’t you? Let’s cuddle here for a minute until you feel better.” “I’m so sorry you got hurt; how distressing! Do you feel better now?” These are comforting phrases that take the emotions down a notch and teach your child how to regulate his own feelings. Sometimes, you may have to hold the child or carry him from the room. But the wise management of specific situations will not dampen your child’s emotional growth. On the other hand, using shame or suppressing the feelings does not help your child learn how to self-regulate his own intense feelings. “Stop jumping around — calm down! You look so silly!” “Don’t be a crybaby — it didn’t hurt that much. Try to control yourself!” If you say these kinds of things as your infant becomes increasingly agitated, you only increase the child’s distress. The child will have a hard time learning how to calm down. Tension regulation, once learned, allows your child to become comfortable with the feeling and expression of a wide range of emotions and to develop self-assurance. It also allows your child to develop the ability to be self-soothing. He learns how to depend on himself — not you — to calm down after experiencing excessive frustration, distress or anger. One woman and her young daughter Maria showed me how this can be a problem. The mom had finally figured out how to calm down her daughter when she became distressed, as she often did when there were a lot of other kids around. All the mother had to do was take her child to the side and read to her for a couple of minutes, but the mother refused to use the technique. “I think my daughter should have to learn to deal with people,” she told me. “It won’t do her any good if I take her out of the situation every time she gets a little bit upset. How is she ever going to learn to cope?” It took me a long time to help the mother understand that by allowing her child to spin out of control and get super-distressed, she was actually making it harder for her child to learn to deal with other people. I suggested to her that if she would help her daughter cool off, then the little girl could find more satisfactory ways, more quickly, to get along in the potentially distressing situation. Maria could then internalize this kind of cooling off process and soothe herself. Other parents have a hard time helping their children develop tension regulation because they themselves have never learned to modulate their frustrations. They have difficulty expressing intense emotions without going to extremes. Since kids are such eager imitators of their parents’ behavior, a mom or dad without good self-control will pass on patterns of unregulated emotional response to the child. This may create a cycle of unhappiness. In many instances, adults with poor tension regulation may be self-destructive and/or violent toward others. In addition, alcohol and drug abuse, domestic abuse, antisocial behavior or having troubled relationships may all result from impaired tension regulation. On the other hand, a child who has good tension regulation is happier, calmer, and more socially comfortable as she grows up. She is able to form a solid sense of who she is and what she wants so that as an adult she can cope with the often overwhelming stresses and tensions of daily life. She becomes comfortable with and understanding her feelings.